I have difficulty painting in public. I never paint my best or even close to my best with an audience. 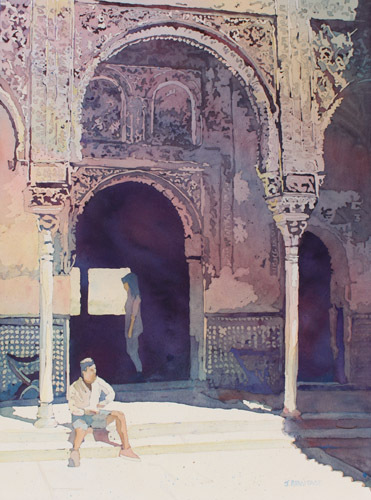 Even at the gallery where people wander in and out infrequently, I have a hard time with painting in company. I don’t blush or drop my brush. But I don’t concentrate as well as I do in private. And I make fundamental errors more frequently. But I must learn to paint in public and soon. And what is more I must be able to talk about it while I do it, because this coming August I have agreed to demonstrate painting and sculpture at the Artisan’s Village in the Oregon State Fair. It’s sculpture that got me into this. I’ve sculpted for seven years now and I’m quite comfortable doing it with an audience. For the last four years I have sculpted all day at just about every art fair I’ve been in. Only heat and fancy carpets stop me. Last Christmas a representative from the Artisan Village saw me demonstrating at the Salem Saturday Market Christmas Show and asked if I would be willing to take a booth at the fair. This is plum. Commercial booths at the fair rent for several thousand dollars. Booths in the Atrisan Village rent for $75.00. The difference? The Village is a juried venue. The catch? 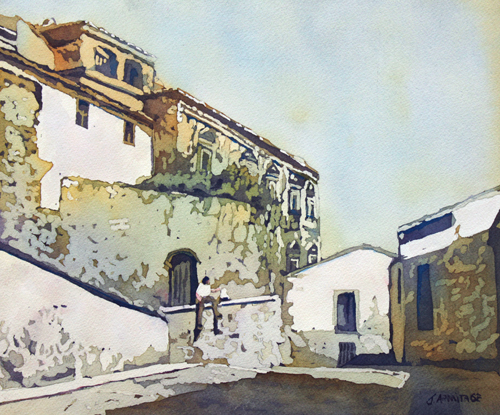 —artists in the Village must demonstrate from 11:00 am to 9:00 pm. Most artist share a booth and share demonstrating hours. But I know no one else who sculpts polymer clay. And besides, it’s an outdoor venue and the hotter it gets the hotter polymer clay gets until it becomes much to soft to sculpt. What to do? Well, I was looking for a way to display my new watercolors so I talked myself and the director into both sculpture and painting. I am to sculpt in the cooler mornings and paint in the heat of the day. Switching mediums halfway through the day should help me keep my brain active too. Now all I have to do is learn to paint in public. I spent this weekend learning. Saturday and Sunday I sold sculpture while painting watercolors. I tried to stick to easy subjects and to leave the detail work for later. I will try my hand at painting in public again at The Salem Art Festival in July, and the Silverton Fine Arts Festival in mid August. At the end of August it’s show time. 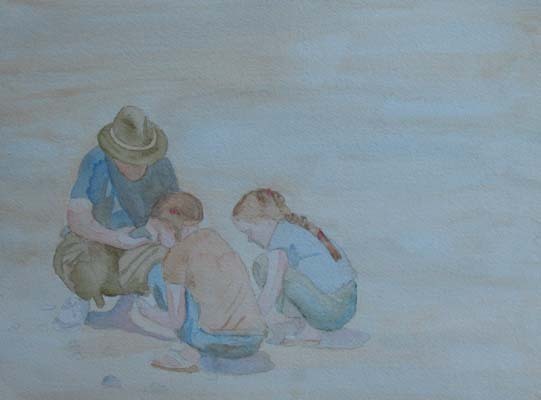 This is the beginning of another painting in my Splash series of the children playing at Town Center Park. 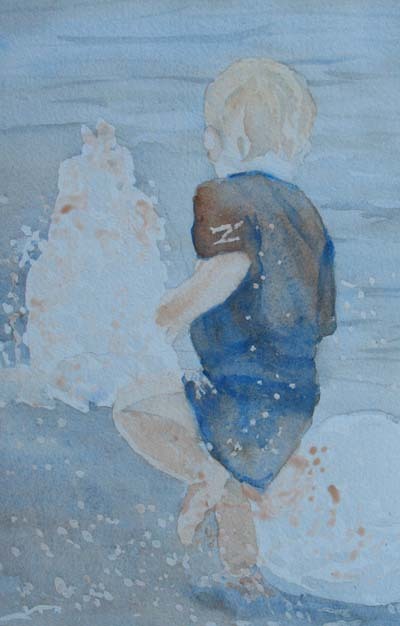 I began by masking the boy and the fountains and painting the water in cobalt blue and burnt sienna. After lifting the first mask I masked the splashes on the boy and the high lights in the fountains. Then I added raw sienna to the palette and began painting the boy. I think I am going to need a real red to complete his skin. Then I will lift the mask and complete the detail work. 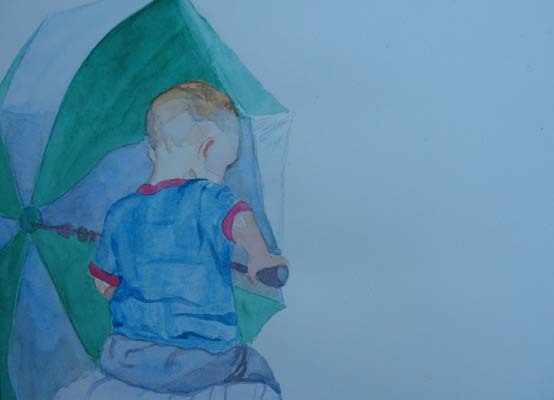 This is a full size painting of the boy with the umbrella. The boy is mostly finished, but I want to add a second umbrella on the lower right. I didn’t have a reference photo for that at the show. But I have plenty of pictures of umbrellas in the same light to choose from here. 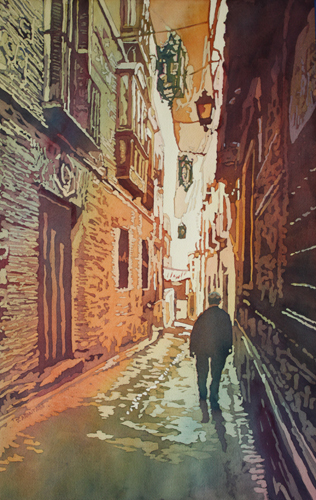 The painting is on hot pressed paper. The palate is cobalt blue, phthalo green, quinacridone deep red rose, yellow ocher and ceruleum blue. 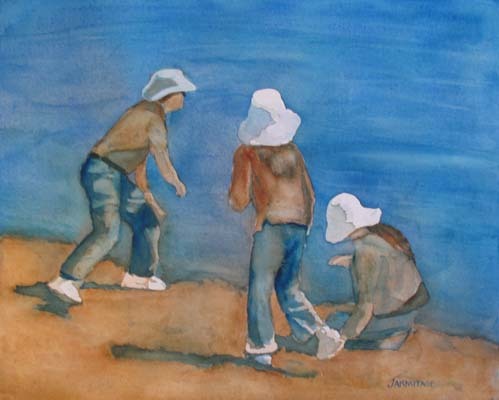 This is a much smaller version of a painting I did a few months ago of my husband and the girls looking for pumice stones at Crater Lake. Stephen loves the original and won’t let me sell it. But it’s too large for his office. I’m hoping to have this smaller office sized version finished in time for his birthday. 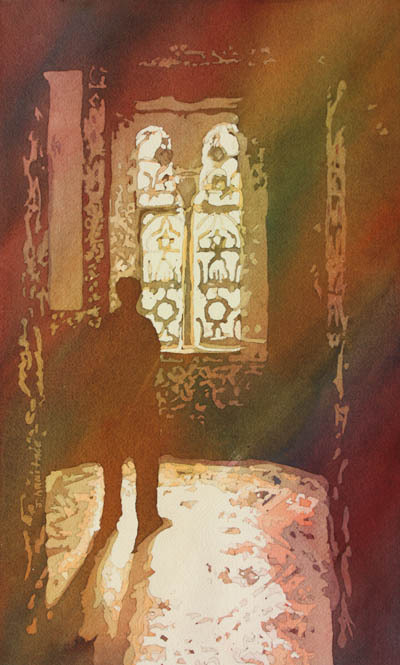 So far I’m using just three pigments: cobalt blue, yellow ocher and burnt sienna. The painting still needs a great deal more contrast. In the meantime I’ll be preparing to sell sculpture and paint at the Salem Art Fair. I will be at the State Fair August 28th through September 1st in Booth 414 on the south side of the village next to the floral gardens. Wish me luck.